If you are a book lover, you know that bookshelves are as important as books. There are many unique bookshelves out there, but DIY bookshelf ideas offer more personal character. You can decorate them anyway you like. Use these inspirations to get your dream bookshelves for a home library. 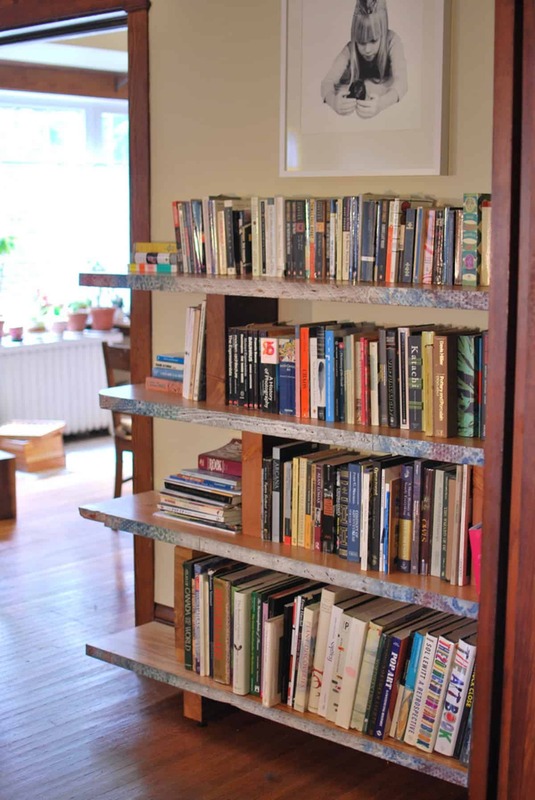 This homemade bookshelf has a simple but ingenious design. the contemporary design makes it look modern and unique. Without back panels, the shelf becomes light and is easy to move around. You can use it to showcase books and ornaments. 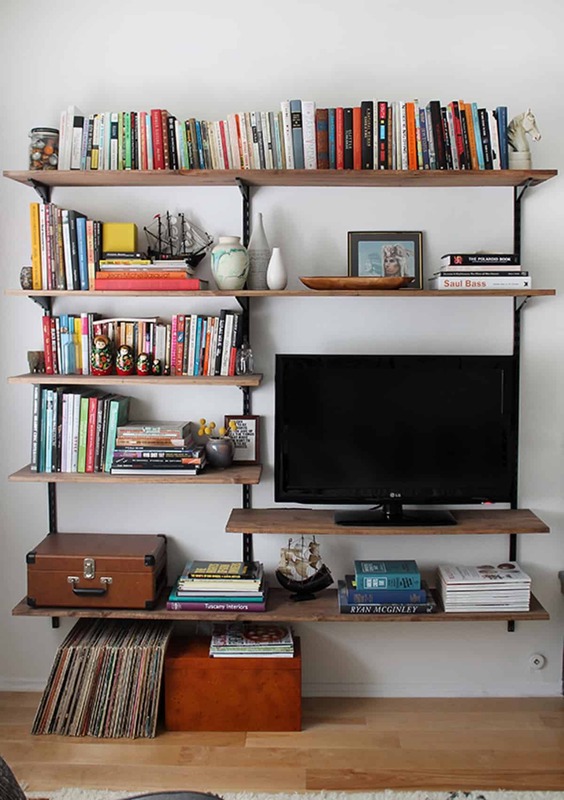 These floating bookshelves are simple but effective. 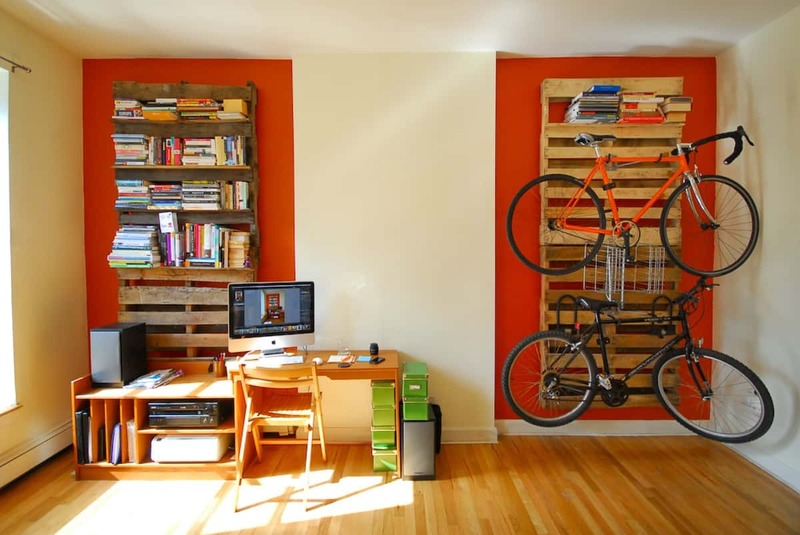 You can use recycled wooden panels for cheap materials. Use these shelves to install books on several spots, especially if you don’t have a dedicated library room. This crate bookshelf is cheap but unique. It was installed on red sections on a white wall, creating characters in the room. You can keep the distressed wood look to create a rustic atmosphere. 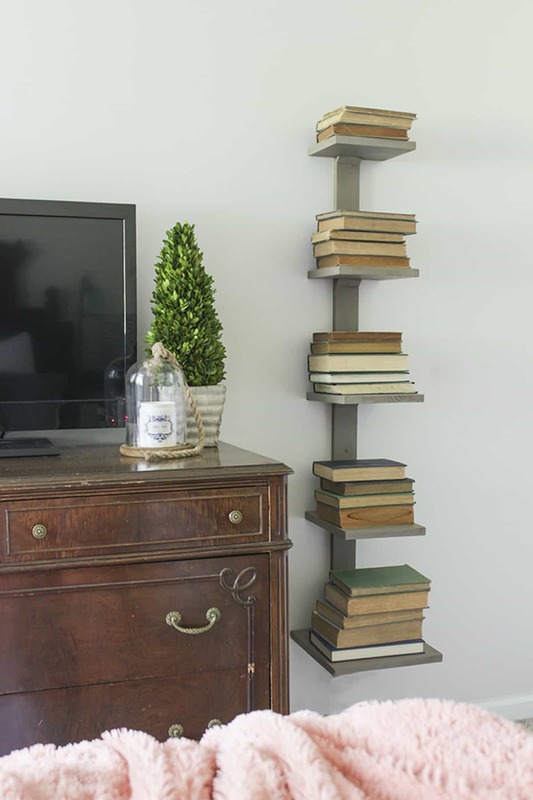 This simple DIY bookshelf has sections that you can use to make a modern arrangement. Instead of book piles or rows, the shelf becomes a place to put pillows and trinkets. The books were arranged artfully to create a unique look. These bookshelf plans consist of wooden panels with different lengths. They were constructed to accommodate a flat screen TV at the bottom. The rest of the shelves accommodate books, records, and pictures. The shelves are attached to the wall by metal bars for support. This shelf consists of several wooden crates. The crate sections create readily-available spaces for books. You can also arrange them artfully, pairing the books with plants and ornaments. The distressed wood look creates a unique atmosphere in a modern room. 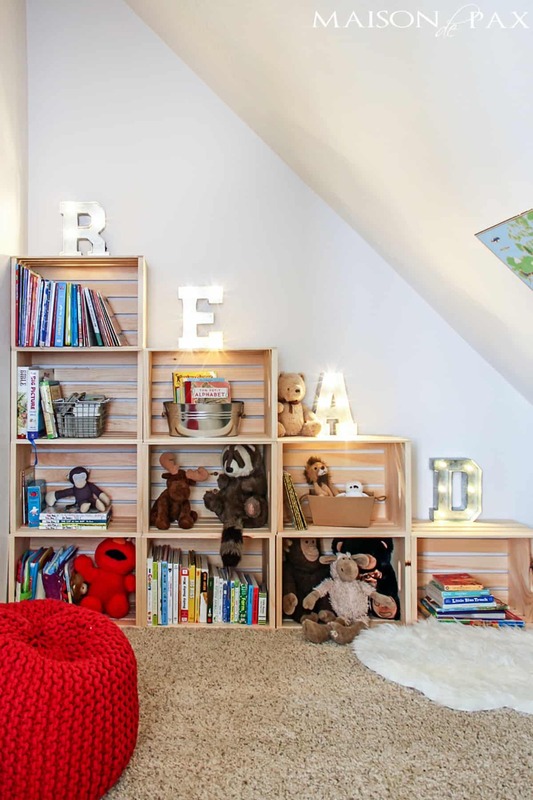 These “basket” shelves have different bright colors that will go perfectly in any kid’s bedroom. 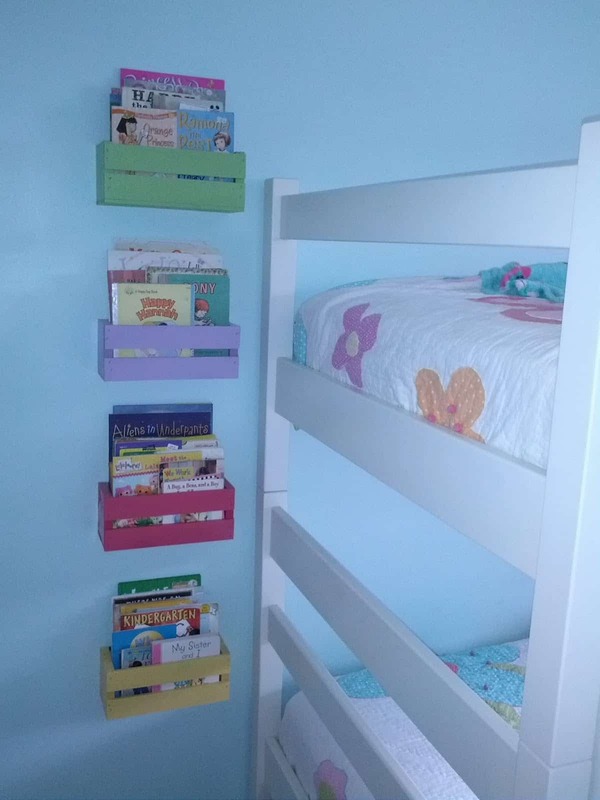 The shelves were installed next to a bunk bed, allowing kids to reach their favorite books or magazines. Need to put a lot of books in a small office? This hanging shelf can be a solution. The panels are connected to straps, which were installed high above the floor. The design is simple and perfect for office supplies. You can also free up some floor space. 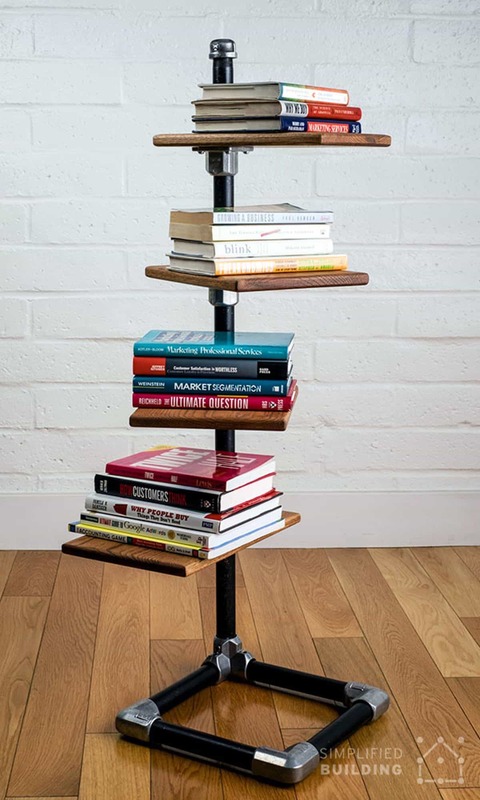 This pedestal-style bookshelf has “spine” that connects several panels. It was installed on the wall to free up floor space. The sleek appearance is also perfect for a small room. You can place an ornament or plant on top to create a unique decoration spot. 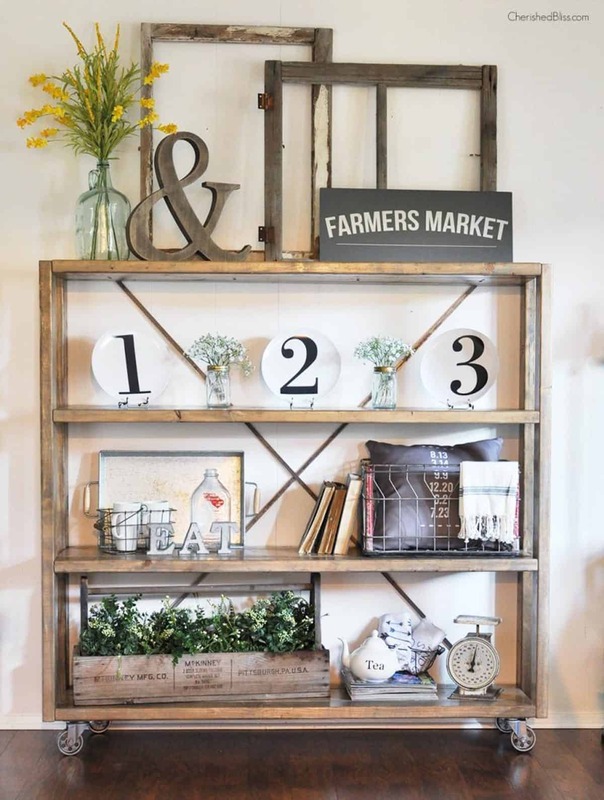 This pallet bookshelf is connected to pipe frames that create strong, industrial decorative elements. The pipes were attached to the wall to support three pallets. The books were arranged with other ornaments that reflect the industrial design element. 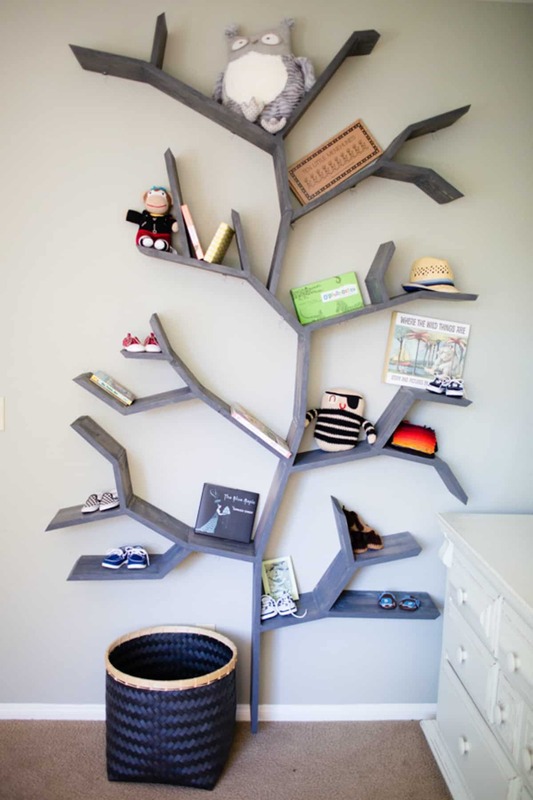 Make your room more interesting with this tree bookshelf. It is popular among book lovers because of its decorative look. 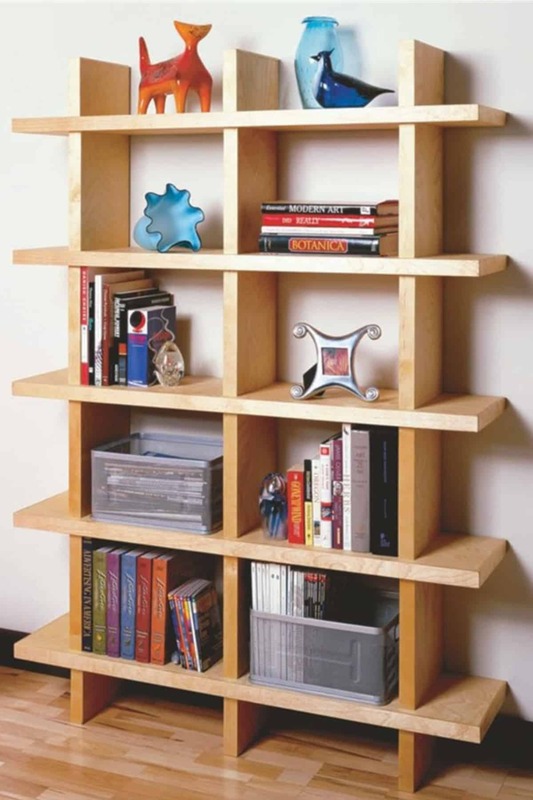 The bookshelf is perfect for a home library, adult’s room, or kid’s room. It is also perfect as a background for Instagram book reviewers. 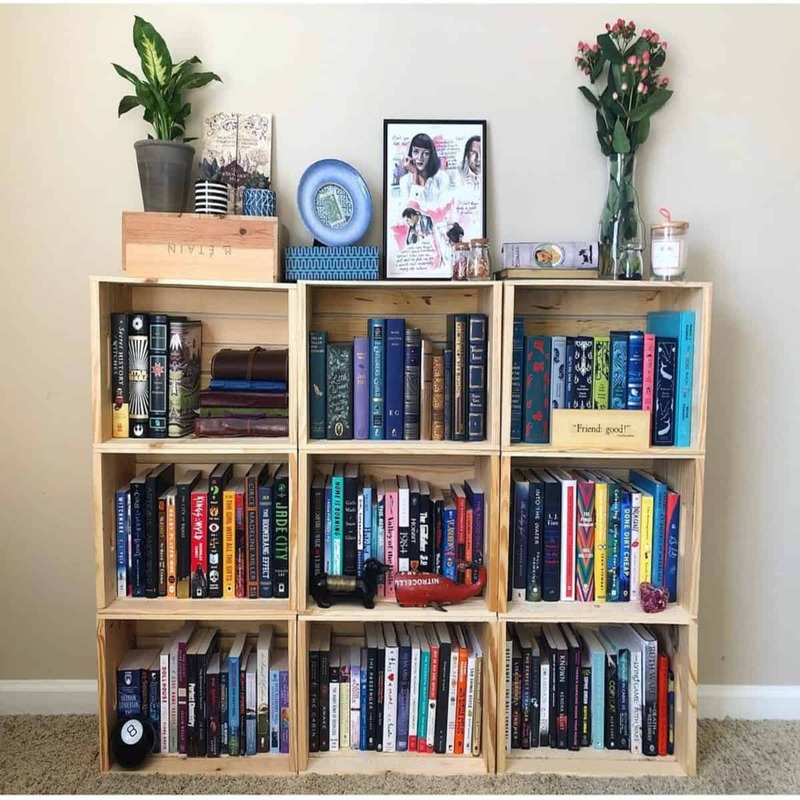 This DIY bookshelf has a simple design, with symmetrical “boxes” that showcase the sides of the books. The top part is used to display homey elements. You can place plants, pictures, and your favorite trinkets or ornaments on top. These bookshelves are held together with wall blocks and strong cables. The blocks are attached to the wall with several screws. The metal cable makes sure that the shelves can hold heavy burdens, even thick, hardcover books. 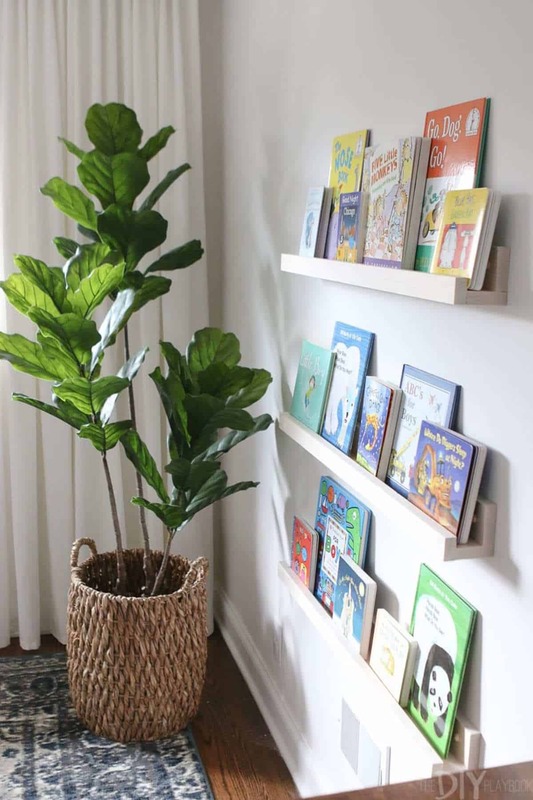 These DIY kid’s bookshelves were built in a playroom. The shelves double as toy storage, and the top parts display the letters of the kid’s favorite activity. The shape was adjusted to the playroom, which was built under the angled wall of a ceiling room. This book “tree” has a free-standing shape that reduces the bulks. Your books only need several wooden panels to be displayed. While it cannot accommodate too many books, you can show off your best book collections in a unique way. Have old, cracked, unused bricks liying around? 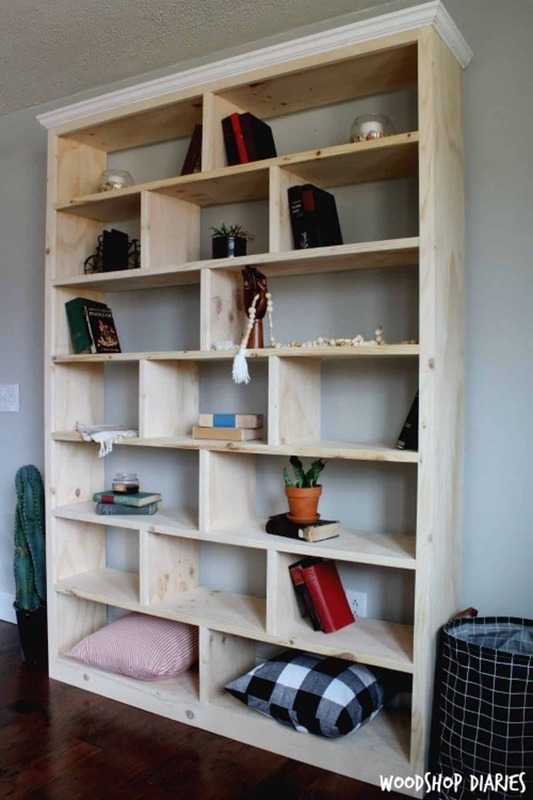 Turn them into creative bookshelves. 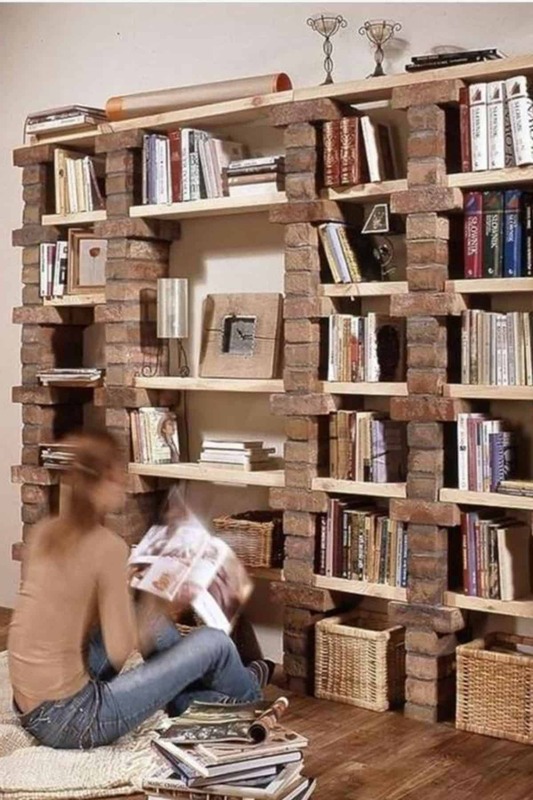 This bookshelf combines wooden panels and bricks in an easy but unique way. You can leave their natural colors to create an earthy look, perfect for adding personality to a modern home. 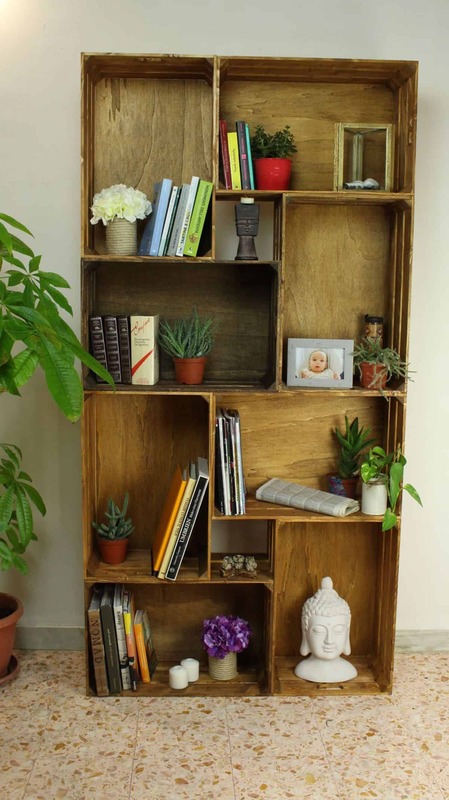 This bookshelf has a simple design, perfect for any DIY project. The bottom part was made taller to accommodate two baskets. 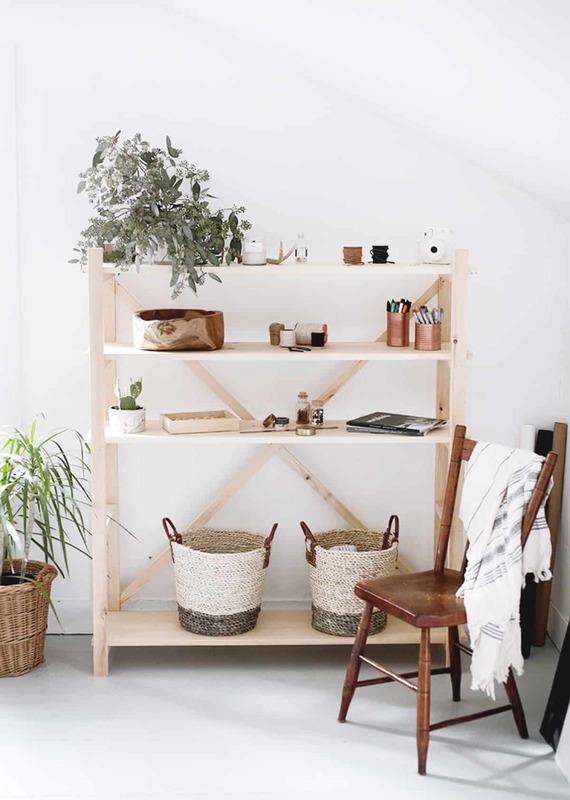 You can use these baskets to store anything, from spare towels to drawing equipment. You can also keep props here if you like photographing books for Instagram. 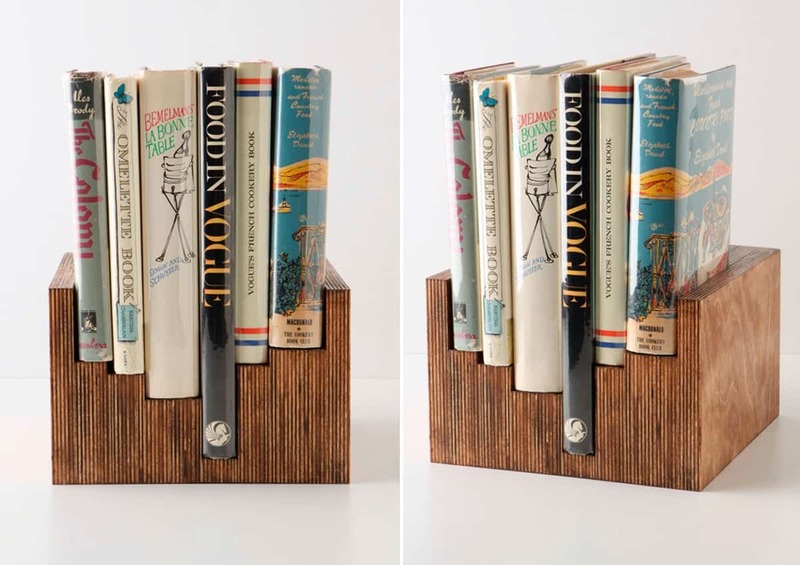 Book ledges are ideal for those who want to show off book covers. Ledges also take up less space than regular shelves. While the numbers of books to store here are limited, you can use the ledges as tools to give “previews” about your home library. 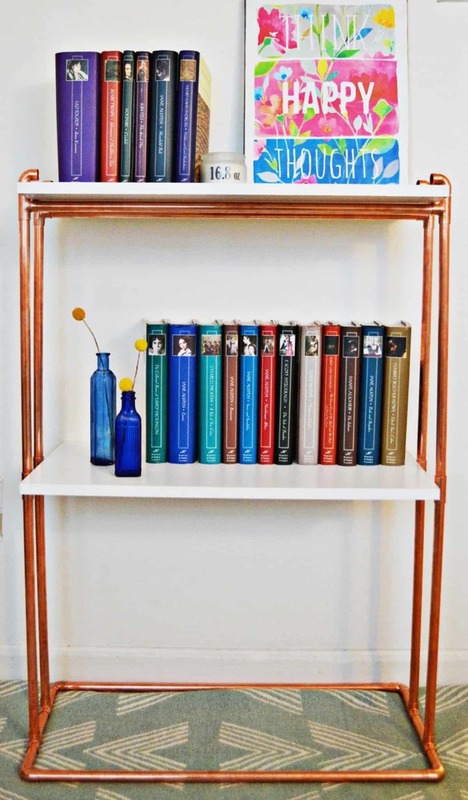 This bookcase consists of thin copper pipes and white panels. The overall look is slim, open, and bulk-free. This design showcases modern design preferences for small homes. You can make this shelf a great spot to display books for Instagram reviews. 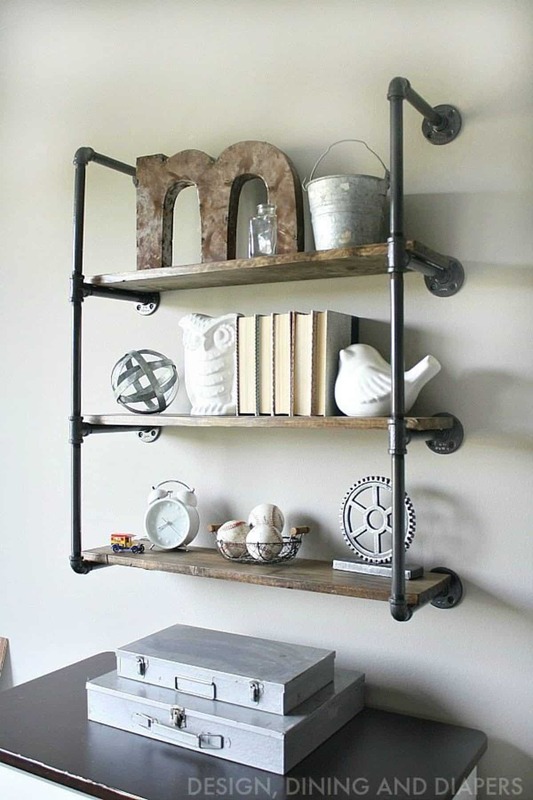 This rustic rolling bookshelf was antique stuff that was restored. The rustic design is suitable for farmhouse-style decorations. In this picture, the books are small parts of the ensemble. The shelves are dominated by pillows, home arts, plants, and vintage cooking equipment. The wheels make it easier for homeowners to move the shelves anywhere. Great bookshelves are as important as the books that they contain. 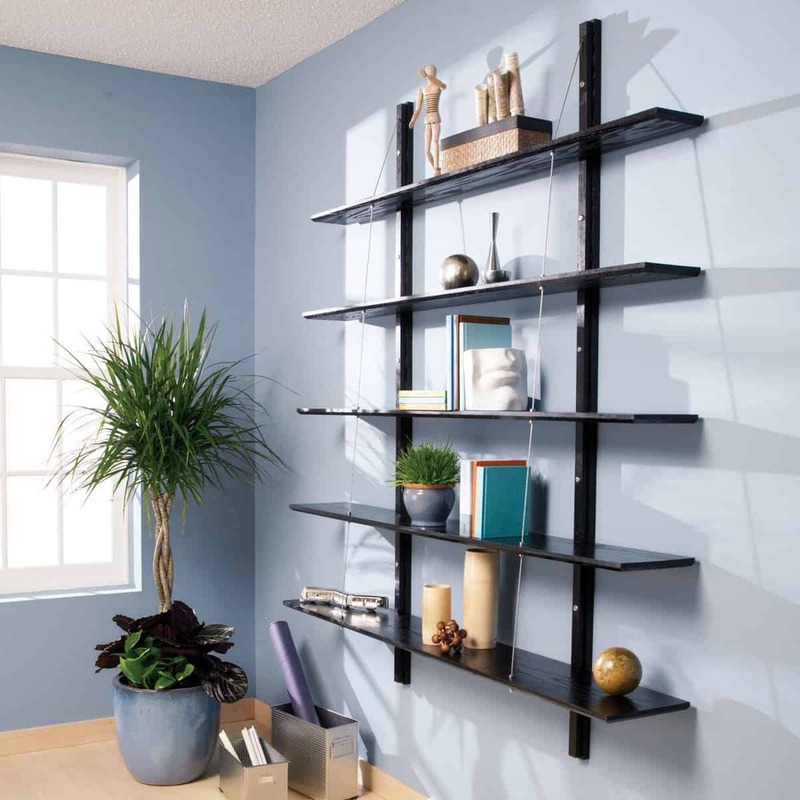 Unique bookshelf also serves as a decorative element at home or office. 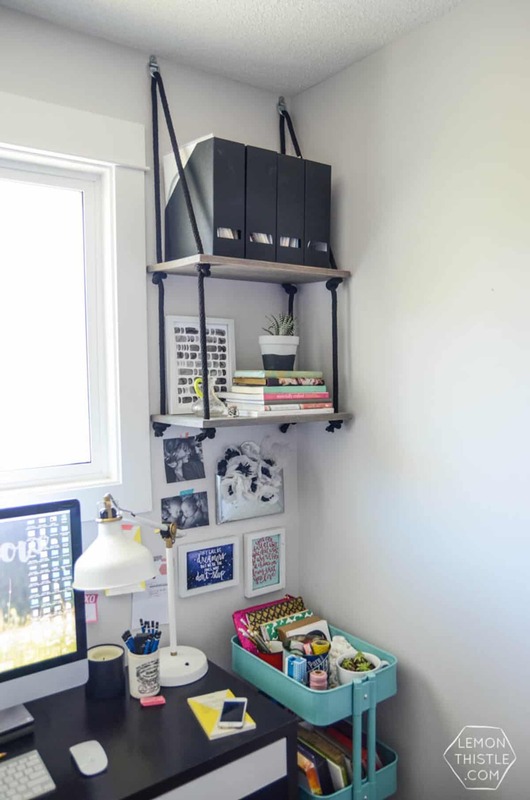 Take your inspiration from these DIY bookshelf ideas, and create a shelf that suits your personality.